Heat olive oil over medium heat in skillet. Saute garlic for 30 seconds then add the sausage and cook until browned. Add roasted red bell peppers, stir, add peas, stir. Cook for a minute or two then add the cilantro and the chicken broth. Simmer for 5 minutes then mix in the cooked white rice. Transfer to a serving dish. Sprinkle hot dish with shredded cheese and let sit for a few minutes for cheese to melt. 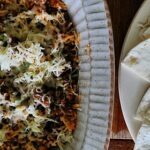 This recipe for Chorizo & Rice Soft Tacos was printed from AmandasCookin.com - https://amandascookin.com/chorizo-rice-soft-tacos/ and can only be printed for education or personal use.